This is our old photo gallery. To see a larger image, click on the photo of your choice. June 25, 2001 - The square is encircled by paraders and doll strollers at the annual Hub Dolly Parade. 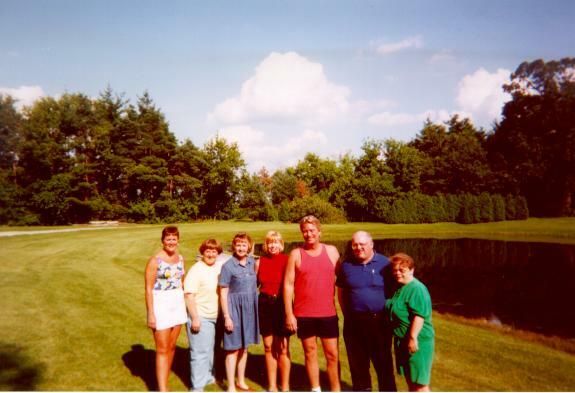 June 25, 2001 - Crown Point residents in the Hub Dolly Parade are proud to show a Michael Jordan doll and a My Twin doll. July 1, 2000 - First meeting, Class of '71 Reunion Committee: Sara Wheeler Beaver, Janet Ross Rattazzi, Cindy Walker Robbins, Kay Carnahan Sullivan (submitted photo), Bill Bendell, Dave Metz, and Dee Haniford Josh from Crown Point buys a soft drink from CPHS cheerleaders Erin and Ashlee at the Taste of Crown Point. 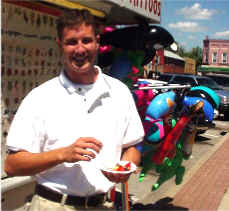 June 2000 Todd Kleven stops for a bite to eat at the Taste of Crown Point during his lunch break. 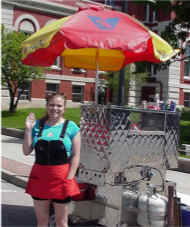 A friendly face you're likely to see on a summer day - Amanda of Katie's on the Square. 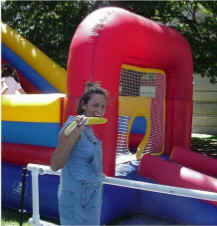 June 2000 Sarah Rose enjoys some corn-on-the cob at the Taste of Crown Point. 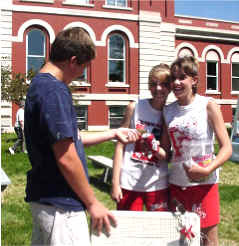 June 2000 Dea Bejster and two youth volunteers at Church of the Four Seasons decorate in preparation for Vacation Bible School to be held in July. Check out the local band Out of Time. 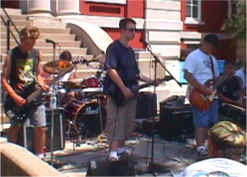 Their web site posts their song list, where they are playing in Crown Point and the region, pictures, and more neat stuff. Investigate and explore some of the places in Crown Point and Northwest Indiana which have been deemed "haunted" by Haunted Indiana.